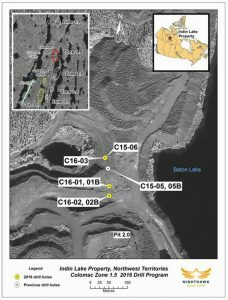 NORTHWEST TERRITORIES – Toronto-based Nighthawk Gold Corp. reports long intersections of high grade gold at the site of the former Colomac gold mine 220 km northwest of Yellowknife. Hole C16-01B intersected 39.60 metres (32 metres true width) of 2.38 g/t Au, including 6.65 metres of 4.76 g/t and including 2.75 metres of 10.09 g/t. Location of latest drill holes. Drilling continues to reinforce the growth potential of high grade zone 1.5 laterally and to depth by building on Nighthawk’s 2014 and 2015 drill results where hole C14-06 (initial discovery hole) intersected 52.50 metres of 7.78 g/t Au, including 21.00 metres of 16.73 g/t and C15-14B returned 32.95 metres of 4.19 g/t Au, including 12.33 metres of 7.77 g/t. Zone 1.5 is now more than 100 metres along strike, traced to a vertical depth of over 200 metres and remains open. The old mine produced about 525,000 oz of gold in the 1990s. Detailed drilling results and more information are available at www.NighthawkGold.com.